Grass is tougher than it looks, so there is no need to water your lawns as long as they are established (i.e. they have been turfed or seeded for a least a year). Adjust the height of your lawnmower blades to cut at 35-40mm, to help the lawn put down deeper roots. Move furniture and toys around to even out the wear on your lawn. 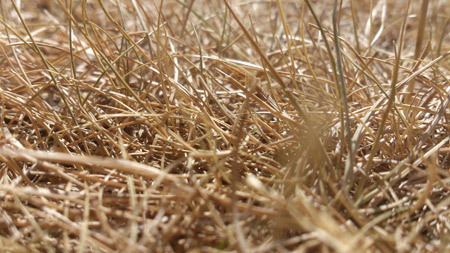 Don’t feed the lawn while it is brown, it is dormant while it protects itself from the heat. Don’t use weed killers unless absolutely necessary – use a spot weed killer if you must. You can add a light compost dressing to the lawn to help retain moisture and provide a little shade to the grass. Scarify your lawn in the Autumn, when grass is growing well, to keep it healthy. If you cannot scarify it in the Autumn then you can do it in Spring, make sure the weather is warm and rainfall is abundant, to help your lawn recover from the process. For more information on repairing a damaged lawn and lawn maintenance visit our project on the main DIY Doctor gardening section.